The launch of the LyovaporTM L-300 and L-200, BUCHI now offers a new platform for freeze drying. The L-200 is designed for quantities up to 6 kg at (-55°C), while the LyovaporTM L-300 is the first freeze dryer for unlimited capacity operating at (-105°C). It also provides a new level of convenience thanks to Infinite-ControlTM and Infinite-TechnologyTM. Both platforms, L-300 and L-200, are individually configurable and adaptable to changing requirements at any time. Both the LyovaporTM L-300 and L-200 come with Infinite-ControlTM. It provides information about the condensers, all shelfs and product-temperatures as well as chamber pressure. “Using Infinite-ControlTM the customer has full control of all relevant process parameters anytime anywhere”, says Philipp John, Product Group Manager at BUCHI. 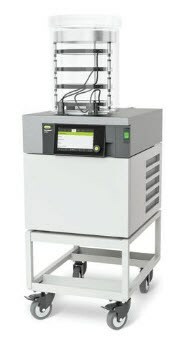 Customers can operate the LyovaporTM directly at the instrument as well as, from the workstation. At the same time, monitoring of all process parameters is feasible from any mobile device. The Infinite-ControlTM software offers data recording, customized reporting, quick design of methods and real-time schematics and diagrams. In addition, the Pro version allows a sample protective state and end-point detection of the sample. The LyovaporTM L-300 is the first laboratory Freeze Dryer with continuous sublimation thanks to Infinite-TechnologyTM. With two condenser and automated hygienic steam cleaning, the L-300 is independent from the lyophilized volume and allow endless capacity with less maintenance.